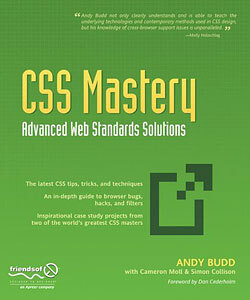 My review of Andy Budd’s new book, CSS Mastery, has been posted over at Digital Web. Enjoy! Great review — I’ve got my own copy of the book and have been dedicating my commute to and from work to (re)learning CSS the right way. After reading your piece, I’m definitely looking forward to getting deeper into the book. If only my commute were longer. Nice job James. I’ll have to pick up a copy of the book. Next Next post: From The Vaults: Got Blog?